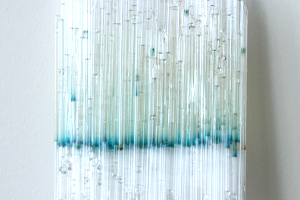 These glass capillaries contain liquid solutions of silver nanoprisms synthesized by artist Kate Nichols. Image courtesy of Kate Nichols. Originally inspired by the work of Northern Renaissance painters, one could also describe artist Kate Nichols as a “Renaissance” artist herself. Nichols applies a wide variety of skills and media to her creations, most recently with her pieces that incorporate her experimentation with nanotechnology. Nichols was fascinated with the rich, bright hues of the Morpho butterfly, and sought to replicate those vivid colors in her work. Through research, she learned that the butterfly wings’ brilliant blue color arose through structural color, and that nanotechnology could help her obtain this vibrant palette. After writing an e-mail to scientist Paul Alivisatos and expressing her interest in nanotechnology, he enthusiastically supported her endeavors (Alivisatos is also a photographer) and Nichols became the first artist-in-residence at the Paul Alivisatos Group at Lawrence Berkeley National Laboratory. Working in the laboratory setting didn’t come naturally to her as she had no background or formal training in science. “I spent the first part of my experience in the laboratory reading scientific papers that would describe specific procedures. And I would get so frustrated that I couldn’t achieve the same results. It takes a lot of practice to be able to be up and running in a material science chemistry lab,” says Nichols. But over time and through the guidance of her colleagues, Nichols learned to synthesize nanosilver particles to create the beautiful colors she uses in her work. Learn more about Nichols and her work in Color By Nano: The Art of Kate Nichols. I would your question if there was a file of the sentences mentioned in video? Because I would like to translate into another language, I’m not good enough in English >< ..